Ok, my family is a little geeky, I admit it. We watch documentaries together more than we watch family friendly movies. What do I discuss with my beautiful wife and exceptional 12 year old daughter as we walk along the beaches of Cape Cod? They both love astronomy, and every year I remind my lovely daughter that there are more stars in the Universe than grains of sand on all the beaches of Earth. However, I’ve always had a nagging doubt about this – is it true? It seems just, well, inconceivable. In my astronomy classes I have often used the claim that there are “more stars in the heavens than all the grains of sand on all the beaches on Earth.” The claim is certainly not original with me, but I had always accepted it without question. Then one day began to wonder if it is really true. After all, there must be a really big number of sand grains on all the planet’s beaches! The discussion concludes, after much mathematical calculation and many “to the nth powers,” that there are 200 billion billion more stars than grains of sand(!) 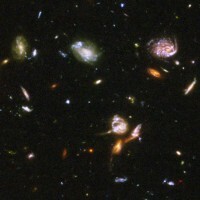 Note that there are an estimated 50 billion galaxies with an estimated 100 billion stars per galaxy. Do the multiplication, and this adds up. Our neighbor, the Andromeda Galaxy, has an estimated trillion stars. Read the full article comparing numbers of stars and grains here. Now where’s that lost shaker of salt? Next post: Do We Have a Deal, or Not?